Several years ago, a winter ice storm toppled half of an old cherry tree in our back yard. My neighbor came over with his chainsaw and converted the bulk of the tree into firewood for his wood stove. I kept a chunk of the bottom of the tree. The slab sat in my garage for years, slowly cracking and checking. Truth be told I had no plans for the wood and kept it mainly in the hopes that I might get a Eureka! moment someday. I can't say the moment ever really came. I thought of things I needed around the house - maybe a new rack for the stereo ? maybe a chair ? 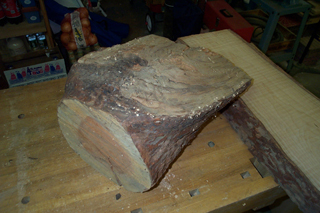 Over time, I decided that the best thing to do was to further reduce the chunk of wood into a workable shape. From there I could get a better "view" of the piece and finally make something. Unfortunately, I can't find pictures of the original chunk of wood. Let's just say that it was large and bulky. 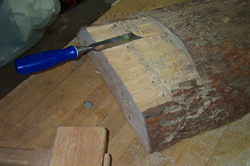 I cut the chunk into two pieces - a lower and upper part. The lower part is still sitting in my garage and will likely end up as firewood this winter. The upper part became this bench/table. The eventual idea was to flatten it and make a combination bench/table; something portable and useable for just about anything that requires a small surface off the floor. I set the height of the finished item at 18 inches - the height for a typical chair, and just a tad under the height of a coffee table or endtable. 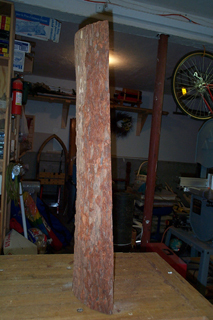 The slab is partly heartwood on one side (down the center) and entirely sapwood on the other. This didn't make for the finest looking chery but the fun part of this project was in making something out of nothing and that's rewarding enough. But first, I had to plane the slab down. To surface the slab I used a router and a straight cutting bit. 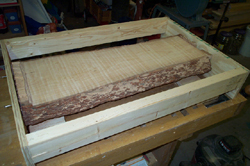 I built a frame around the slab, mounted the slab to the frame, shimmed it to the desired height and ran the router across the top side until the surface was decently flat. I then flipped the unit over and repeated the process on the other side. 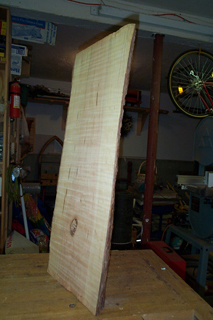 The final thickness of the slab was just under 2 inches. Routing the top side revealed a rotted knot that I had to take care of later. 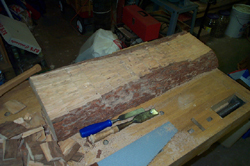 The bark on the two long sides was removed with a chisel and some sandpaper. 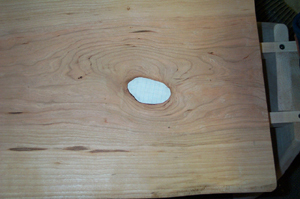 The two short ends were roughly squared on a table saw to remove the ends that had screw holes (from mounting in the router surfacing frame). 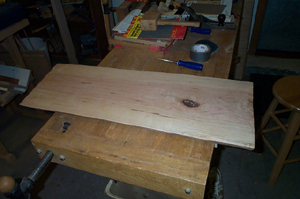 Next came further smoothing of the surface with various hand planes, followed with sanding with 60 grit sandpaper. At this point I had to consider what the rest of the supporting legs/structure would look like and how everything would be fastened together. Since the project is about of recycling lumber, I opted to use only lumber I already had. I didn't have much cherry so the legs had to be made from something else. I had some 4/4 maple (planned to about 31/32) and the contrast of dark cherry to light maple made it a reasonable choice. Designing the legs took a considerable amount of time. 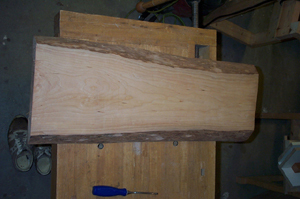 The slab measured rougly 30 x 13 inches; large enough to be stable as a small bench. I needed legs sturdy enough to hold the weight of two people without being so bulky that they would overpower the slab in terms of appearance. My stock of maple also limited the width of whatever I made to about 7 inches ! Another consideration for the legs is how they would be attached to the slab. I wanted the legs to be a standalone item; literally capable of standing on its own. In theory, the legs would be able to support any slab of similar size; not just this one. 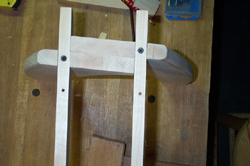 Making self-standing legs allowed me to work on both pieces (leg assembly and table top) at the same time and ultimately, allow me to apply the finish seperately and more easily. The leg design I came up with consists of four seperate legs arranged in two pairs. For each pair, the two legs overlap one another to provide strength and added width. The final width at the bottom of each leg pair is about 15 inches - wider than the slab's width - thus giving the unit added stability. Overlapping the legs solved the problem of using only a 7 inch wide piece of maple but it also meant the legs would not be evenly spaced on the slab. To fix that, I angled the leg pairs relative to the center line of the slab. If you drew a line from the center of each foot (1/'2 inch from the outside edge of each foot) to the opposite foot in the pair, you'll find this line to be perpendicular to the centerline. 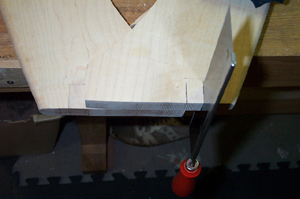 To connect the two leg pairs and to reinforce the entire structure from raking forces, I used two stretchers that span the top of both leg pairs. These also serve as the mounting points for the slab. Their placement is such that they hide the ends of the overlaping region. The result is a bit of an optical illusion. When viewed from various angles, some of the legs seem as if they are not perpendicular to the ground (due to the arch and the offset placement). Viewed from the side, the angled legs always appear the same regardless of which side you look from. All of this may not make any sense so please look at the pictures ! I made a leg template on a brown paper grocery bag. 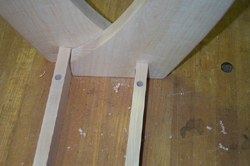 This made two identical legs which I then traced on the maple stock. By angling the legs, I was able to get more than the 7 inches of width I was limited to. 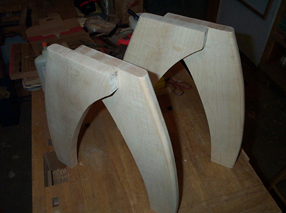 The legs were cut out on a bandsaw and sanded smooth by hand. 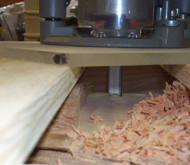 The outside edge was fed through a 1/4 inch roundover bit in a router table. 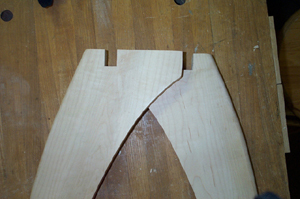 A "good" and "bad" side for each legs was selected; and the "bad" side became the inside surface of the leg pairs. Each pair was glued and then screwed together at two points. The screws were recessed and capped with a maple plug. The stretchers are about 27 x 1-1/2 x 3/4 inches thick. 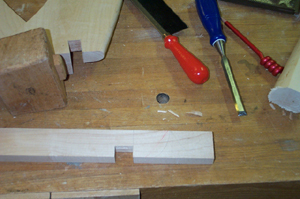 Overlapping notches were cut by hand and finished with a chisel at a 4 degree angle. This compensates for the tilt in the legs. 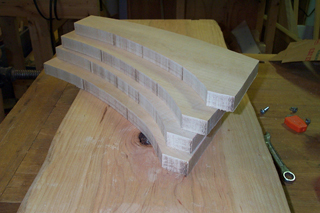 The ends of each stretcher is curved upwards to complete the look. Because of the overlapping legs, the distance from leg to the end of each stretcher is different for each stretcher pair at each end. 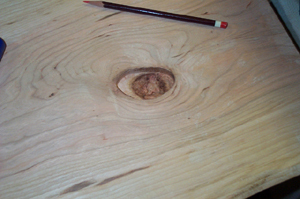 (Various stages of repair on the rotted knot. At this point, the slab still has a hole on its top side. I used my Dremel as a router and squared off the wall of the hole. 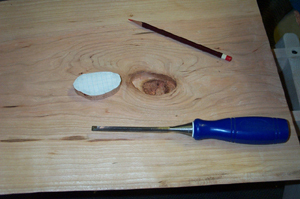 I traced the shape of the opening onto a piece of paper with a pencil and glued the paper to some scrap cherry whose thickness would make it fit just about right. Through lots of trial and error, this cherry plug was shapped on the bandsaw until it fit snugly into the hole. 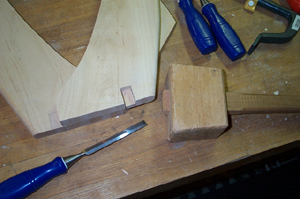 The paper on the plug was then removed with a hand plane. 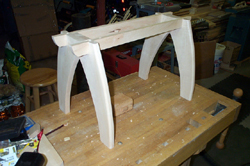 I then sanded the four leg parts (two stretchers and two leg pairs) and the top slab in grit increments up to 400 grit. I also drilled four recessed mounting holes on a drill press (it would be almost impossible to do this on the press after assembly). 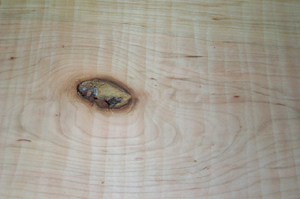 The slab received a coating of chery colored Watco Danish oil to better color match the sapwood with the heartwood. This also helped colormatch the chery plug with the rest of the slab. The legs did not get any oil. Once assembled, the legs were held in place by 4 screws; one at each intersection of a stretcher and leg. The resulting structure is very strong and stable. Next came many coats of a semi-gloss water-based polyurethane. Extra poly was applied to the most exposed areas like the arched legs and top of the slab. Final assembly required just four screws in the pre-drilled holes of the stretchers. I let the unit cure for about 4 days before letting the kids loose on it.